Snooper S900 Syrius LITE features the best and most up to date street level navigation for Europe from NAVTEQ, Snooper’s award winning AURA speed camera detection (via subscription), Lane guidance, My Speed and 4.3-inch full colour touch screen display. All neatly housed in a sleek piano black casing. Snooper S900 Syrius LITE My Speed feature provides the speed limit of nearly every road across Europe which is clearly displayed on the Snooper S900 Syrius LITE at all times. My Speed can also be set to alert you if you accidentally exceed the speed limit. Snooper S900 Syrius LITE has been discontinued. Accessories, spares and parts are still available for your S900 Syrius Lite. Snooper S900 Syrius LITE satellite navigation system includes maps of the United Kingdom and Republic of Ireland. The Snooper S900 Syrius LITE features a super bright 4.3-inch colour widescreen touch screen display with turn by turn navigation, voice guided instructions and a full 8-digit UK postcode searches with a choice of 2D or 3D moving map display. The Snooper S900 Syrius LITE in addition features the award winning AURA speed camera database which is updated on a daily basis and includes multi-route planning. Snooper S900 Syrius LITE with AURA speed camera database provides alerts to speed cameras locations in United Kingdom and Republic of Ireland (subscription applies). Snooper S900 Syrius LITE features specially formulated lane guidance software provides advanced notice of which lane or lanes to use when approaching junctions for safer driving. The speed limit of nearly every road across the UK and Europe is now clearly displayed on your Snooper S900 Syrius LITE at all times. My Speed can also be set to alert you if you accidentally exceed the speed limit. Snooper Syrius LITE S900 incorporates multi-route as standard. Multi-route allows you to calculate a single route around up to 16 different destinations just by adding the post codes. No stopping and starting, struggling to find each and every address, simply your full day’s travel calculated and saved in just a few seconds. Turn off the route by mistake or decide you want to go another way? Snooper S900 Syrius LITE will automatically re-route you in seconds, getting you back on track or will find an alternative route. Going off the beaten track? All you need is the geographical co-ordinate and Snooper S900 Syrius LITE will take you straight there. Unlike AURA, many other GPS databases rely largely on locations provided by hobbyists who might not be able to tell a speed camera or a red light camera from a traffic flow camera or a surveillance camera. These databases could result in annoying false alerts, which could lead you to start ignoring even legitimate alerts --defeating the point of having a GPS database in the first place. Snooper S900 Syrius LITE will provide personal alerts of the following speed traps and hazards:- Gatso cameras, Watchman, (Multi Camera System), Speedcurb, SPECs average speed, Roadwork cameras, DS 2, Accident Hotspots, High Risk Zones, Mobile Laser, Mobile Safety Vans, Temporary Gatso, Truvelo Cameras, Congestion Charge Cameras, Digital Cameras, Schools (optional). Included in the Snooper S900 Syrius LITE are speed camera locations in Germany, Holland, Belgium, France, Spain, Portugal, Switzerland, Italy, Austria, Luxembourg, Denmark, Norway, Sweden, Finland, Poland, Romania, Russia, North America, Canada, Australia, New Zealand and South Africa and is still growing. The Snooper S900 Syrius LITE is mounted on the inside of your vehicles windscreen using the suction cup windscreen bracket provided. The Snooper S900 Syrius LITE can be powered directly either from its internal battery if it's fully charged or powered from the cigarette lighter socket. Recognised as the industry leader in digital street level mapping, Snooper S900 Syrius LITE UK and Ireland uses NAVTEQ map data. Ensuring you are taken seamlessly from A to B on the best possible route with full UK 8-digit postcode search. To ensure the most accurate postcode search available Snooper S900 Syrius LITE uses Ordnance Survey, the most comprehensive of it's kind. Snooper S900 Syrius LITE utilises the AURA database, the most comprehensive speed camera database available offering you the ability to download new camera data seconds after it has been recorded in the database. The AURA speed camera database provides alerts to speed cameras locations in United Kingdom and Republic of Ireland. 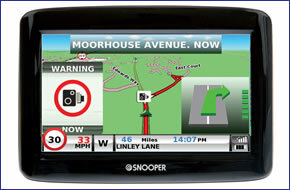 To download and successfully update the Snooper S900 Syrius LITE with software, sat nav map updates and/or speed camera locations via a computer you will need a PC running either Windows XP (32-Bit), Windows Vista (32-Bit), Windows Vista (64-Bit), Windows 7 (32-Bit), Windows 7 (64-Bit) or Windows 8 (64-Bit) with an internet connection. Please note: the S900 LITE, as with all Snooper products, is not Apple MAC compatible. The Snooper S900 Syrius LITE caravan/motorhome sat nav may now have been discontinued, however all of the accessories are available to buy from ActiveGPS. We sell replacement Snooper S900 windscreen mounts, car chargers that came supplied as standard with the Snooper S900 Syrius. Plus we also sell a range of extra parts including a mains charger, hardwire power cable and a carry case. View all S900 accessories. Do you have a question about the Snooper S900 Syrius LITE? Submit your question via our contact page.